Help beat those high gas prices by making dinner at home, better yet make your favorite restaurant dish at home. We all know that eating dinner out can quickly drain your wallet, but it's hard to give up the convenience and the delicious dishes! But in tough times you do have to make some tough choices. Thankfully with these 13 Secret Chicken Copycat Restaurant Recipes you can make some of the best copycat recipes from restaurants right at home. Dining in just got easier and more delicious. Thanks to the many home cooks out there who have tested out these dishes we are lucky to have these popular copycat restaurant recipes available. One of the most popular chicken copycat restaurant recipes is for chicken marsala. There are a lot of restaurants that make it, all with their own twist and special ingredients to make it their own. It's a favorite dish, but also fairly budget friendly as it doesn't need a lot of ingredients. Let's take a closer look at one of these and just how easy it is to make chicken copycat restaurant recipes. Be sure to also check out the New Bonus Recipe at the bottom! Taking several tablespoons at a time, stir in butter until sauce is creamy. Saute your mushrooms in a separate frying pan in light oil. Add hot sauteed mushrooms to the sauce. Pour sauce over grilled chicken before serving. Garnish with parsley if desired. Bring home some of your favorite Asian-inspired chicken copycat restaurant recipes with these delicious dishes modeled after the popular Benihana restaurant. Chicken recipes like these are too good to pass up making. The always popular and easy to make Chili's-style dishes are at its best with these easy chicken copycat restaurant recipes. Why head out and wait for a table when you can so easily make these at home. Where every day is Friday, these copycat restaurant recipes are some of the most popular dishes inspired by TGI Fridays. When copycat chicken recipes, Friday's knows where it's at. Explore even more of your restaurant favorites with these top-rated copycat recipes from Cracker Barrel, Olive Garden and more. 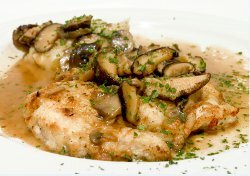 Plus check out two more must-have chicken marsala dishes from your favorite restaurants. Can't get enough of these amazing chicken copycat restaurant recipes? Find more chicken recipes and other ideas in this free 27 Secret Restaurant Copycat Recipes eCookbook. Why can't I download from this site. I have been having problems with this site. I had the best chicken dinner at the Cracker Barrel. It was a roasted chicken with apples and onions in a sweet sauce. To dye for. I will go back to have it again.